MARCO ISLAND, FL--(Marketwired - Jan 14, 2014) - The world's most frequent travelers have spoken, and when it comes to the Top 10 Islands in the United States, Florida's Marco Island has earned a spot at number 3 on TripAdvisor's annual list. Home to the Marco Island Marriott Beach Resort, Golf Club & Spa, the island is lauded for its "white beaches" and "sparkling sea," and known as a place where visitors can "scavenge for seashells or hit the links for a sunny session of golf." Marco Island, home to this beach resort in South Florida, is also conveniently located for exploring "the Everglades in a swamp buggy" or taking a "rejuvenating nature hike at the Rookery Bay Reserve." The island-ranking list is part of TripAdvisor's annual Travelers' Choice Awards and is "based on the quality and quantity of the most highly rated hotels, restaurants and attractions listed for each island on TripAdvisor gathered during a 12-month period." The Marco Island vacation destination beat out Maui, Hawaii Island and other Florida locations including Key West, Amelia Island and Sanibel Island to achieve its number-three ranking on the list. Those who want to escape the cold and experience Marco Island firsthand can get away with a special Florida Gulf Coast vacation package. Through March 31, 2014, the Marco Island Marriott Beach Resort, Golf Club & Spa is offering More is Less. With this special promotion, guests will save 15% on 2-night stays and 20% on stays of 3 or more nights. To save on a beach vacation, book the More is Less promotion online at www.marriott.com/specials/mesOffer.mi?marrOfferId=793567, or by calling 1-800-721-6996 in the US. When making a reservation, be sure to enter/mention promotional code D3Q. From destination weddings and corporate retreats to family vacations and staycations, the Marco Island Marriott Beach Resort, Golf Club & Spa offers a secluded yet convenient island escape in south Florida. Located on three miles of pristine white-sand beach, the vacation resort offers numerous options for recreation and relaxation. Guests can spend time on the beach or soaking up the sun in two outdoor pools; head out on the water with boating, kayaking and sailing; indulge in a treatment at the Balinese-style spa or focus on working out or working on their game at the fitness center and two private 18-hole championship golf courses. For young guests, Tiki Tribe offers supervised activities for kids ages 5 to 12. Dining also offers plenty of options with eight venues including prime steaks and seafood at the trendy Kurrents and the island's best breakfast buffet at the informal Tropiks Restaurant. With a location close to Naples and Fort Myers, the hotel is also a top wedding and meeting venue, offering nearly 57,000 square feet of event space. Accommodations can cater groups, too, and feature plenty of space, private terraces with Gulf views, plush bedding, a marble bathroom, 36-inch flat-screen TV, minifridge, coffee/tea service, high-speed Internet access and a desk. Marco Island Marriott Beach Resort, Golf Club & Spa is a pristine beachfront property on the Florida Gulf Coast. 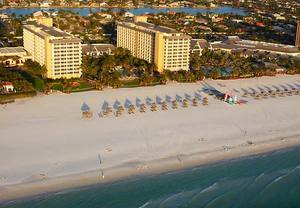 The beach resort is located on Marco Island, which has earned a spot at number 3 on TripAdvisor’s annual list of top islands in the United States.